Talk about writing history with lightning. Cecil Gaines (Forest Whitaker) joins the White House staff as a butler in 1957 just in time to watch Ike (Robin Williams) paint and federalize the National Guard in Little Rock. Then “that slick white boy” JFK (James Marsden) shows up with his bad back, cute daughter, hot wife (Minka Kelly), and makes his great civil rights speech during Birmingham, but of course, bam! bam! he’s assassinated, and that leaves LBJ (Liev Schrieber) to dictate civil rights from the toilet and push for the Voting Rights Act and say in a televised speech “We shall overcome.” But of course Vietnam comes along, MLK is assassinated, and Nixon (John Cusack), newly installed in the White House, plots against the Black Panthers, then sits sweating out his last days in office. Ford and Carter come and go, playing themselves in newsreel footage, before Reagan (Alan Rickman), in 1986, insists he will veto any sanctions against South Africa. Meanwhile, all this time, Cecil’s son, Louis (David Oyelowo), against his father’s wishes, attends Fisk, where he gets involved in the Nashville sit-ins, becomes a Freedom Rider in the Deep South, is hosed down and attacked by Bull Connor’s dogs in Birmingham, then gets beaten on the Edmund Pettus Bridge. He’s in Martin Luther King’s motel room in Memphis when Dr. King is assassinated, so of course he becomes a Black Panther, sitting around the dining table in a black beret and dissing his father and Sidney Poitier with his long-time girlfriend, Carol (Yaya Alafia), now sporting a scowl and a huge Angela Davis afro. But he leaves the Panthers, gets a Masters in political science, runs for Congress, and in 1986 leads an anti-Apartheid rally at the White House, where his father, finally retiring, finally joins him in protest. Meanwhile, all this time, his wife, Gloria (Oprah Winfrey) ... Well, she’s not really involved in history the way they are. She’s got her own subplots. She’s proud of Cecil, then bored because he’s never home, then fools around with the local ne’er-do-well (Terrence Howard) and becomes an alcoholic. She’s jealous of Jackie Kennedy for some reason. But she shapes up, mourns the death of her youngest son, Charlie (Elijah Kelly), who inexplicably leaves college to go to Vietnam, then dies of old age right before Obama is elected. I’m sorry. I knew going in that “The Butler” would be, in Woodrow Wilson’s phrase, like writing history with lightning. The years would tumble, and our main characters would bump up against historic events. I just didn’t know how much. Wilson’s quote referred to “The Birth of a Nation,” and he supposedly added, “My only regret is that it is all so terribly true.” Of course it wasn’t. And neither is this. The most untrue thing? The tagline. It reads: “One quiet voice can ignite a revolution.” Whose quiet voice? Not Rosa Parks. Not Dr. King. It’s the butler. It’s Cecil Gaines. According to the movie, at opportune moments, the various POTUSes ask him about him and his, and what he thinks about this and that, and sometimes he says, and it leads them into doing the right thing about race matters. All those boycotts and sit-ins and jail-ins and protests and marches? Dr. King and the SCLC and SNCC and CORE might as well have stayed home. But that sense—that history isn’t always made in the halls of power—is forgotten amid Gloria’s infidelities and her inexplicable jealousy over Jackie. Not to mention hanging out in the halls of power. You know what else is forgotten? The March on Washington. Plus the SCLC and SNCC and CORE. Who do we blame? Is the medium just wrong? Does it try to do too much in two hours? Does it tack on Oprah’s unnecessary subplots and does the son’s Forrest Gump-like tendency to be at every major civil rights moment stretch credulity? I helped write a piece a few years back about a top Georgia attorney, Richard H. Sinkfield, who was in Montgomery during the bus boycotts, helped with the Nashville sit-ins, and was in Memphis when Dr. King was assassinated, but even he was given a breather now and again. No Freedom Rides, Birmingham, Selma, Malcolm X rallies. Right, Louis and Carol also attend a Malcolm X rally in 1965. Forgot to mention that. Thank God it’s not the one where he gets assassinated. Director Lee Daniels (“Precious”) and screenwriter Danny Strong (HBO’s “Recount” and “Game Change”) move the history parade along at an easy clip, and though they foreground Cecil he still gets lost in it all. He’s supposed to be unknowable but he’s unknowable to us, too. Does he have a thing for the Kennedys? For Caroline? A “Bluest Eye”-type thing. Was the article upon which the movie was based, Wil Haygood’s “A Butler Well Served By This Election,” too schmaltzy? Does the movie spend too much time defending that which doesn’t need defending? Cecil’s lifelong service? Does it not juxtapose well enough the father’s service to the family versus the son’s service to the cause? Should the first son have been the SNCC student while the second son became the Black Panther? Wouldn’t that have been more logical? I know. People tried. I know. 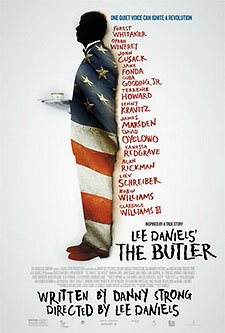 “The Butler” was hard to get it made in the first place. Right-wingers, I’m sure, will squawk about “The Butler,” if they haven’t already, since it paints the Dems in a more-or-less positive light, but less so Nixon and Reagan. It also casts, as Ron and Nancy, a homosexual and Jane Fonda. Ha! And it ends on the very positive note of Obama’s election. I teared up a bit then. It got me then. I admit it. They shouldn’t squawk. The hero, and the movie’s ethos, is ultimately conservative: Do your job, listen to your parents, don’t belch at the dining table, and maybe you too can influence history. It’s a movie for Bill Cosby.